Task: To automate the production of extractor bucket teeth on site at an opencast coal mine in Poland. Solution: Reallocate the three manual welders previously tasked with producing the teeth to other welding jobs and use FANUC ARC Mate 100iC robots to weld the replacement teeth efficiently to exacting standards. Result: By switching from manual to robotic welding, production of teeth has increased from 30 to 70 per day. Repeatability and weld quality have increased significantly and, because ARC Mate welds more precise seams than the manual welders, material savings are also being made. Energoinwest SERWIS extracts lignite used mainly as fuel at Pątnów I, Pątnów II and Konin electrical power plants. First robotised welding station in the coal mine was commissioned in 1992, with more robots installed in the next years. Thanks to robotisation, the mine successfully automated the production of certain machine parts which become worn out when extracting coal and thus have to be repeatedly replaced. This allowed the company to streamline the supply of bucket teeth to strip pits, with a significant impact on the continuity of extraction. The case study below is based on information obtained from Mr Stanisław Nożewski, P-2 Department Manager at Energoinwest SERWIS. In what ways are industrial robots used in coal extraction? Obviously in an indirect way. To extract coal, we must first remove the overburden – the soil overlying the mineral deposit. For this purpose we use excavators. The excavators are equipped with bucket wheels, and buckets have corners or teeth for breaking up the soil collected into the bucket. We have automated the production of teeth (they are internally called replaceable teeth ZWN-1 and ZWN-1M). This allowed us to increase manufacturing flexibility and repeatability. We have also reported a reduction in the demand for welding materials. As for manufacturing flexibility, the robots that we use (FANUC ARC Mate 100iC) feature storage capacity for a large number of programmes. So, if we only want to change the type of the manufactured component (this could be the ZWN-1 short tooth or the ZWN-1M long tooth), it’s enough for the operator to select a suitable programme by changing the position of a switch. Speaking of manufacturing repeatability, an industrial robot will apply an identical weld precisely in the same location. Manual welding often does not guarantee sufficient repeatability and quality of welds, so in many cases it’s necessary to make corrections. Precious time is wasted and unnecessary costs are generated, which in effect means lower production efficiency. Automation has also reduced the number of excessively thick welds that were likely to appear in manual welding. A welder usually uses a safety margin in relation to every weld made – thus using up more welding material than necessary. A robot is more precise and effective in its use of materials – which means noticeable savings. Aside from the savings, how did production process automation influence the effectiveness in your plant? We make around 25,000 teeth per year. For such production we normally needed three to four employees. Now we use two industrial robots which make the same number of teeth – the difference being that they are operated by only one person! I should also mention that the efficiency of these robots is very high – a worker is able to weld up to 30 teeth a day, but in the same period a robot may weld as many as 70 teeth, which is over 100% more. Industrial robots in our plant work in a two-shift system, altogether sixteen hours a day. They don’t need lunch breaks, they don’t take sick leave or demand social security – they work all the time. Consequently, there’s no possibility of any downtime in mining operations due to lack of teeth for replacement. Does this mean that the implementation of robots in your company entailed a reduction in employment? First and foremost, I’d like to stress that we didn’t make anyone redundant, on the contrary – we didn’t have enough people to do the work. Previously we had to man manual welding workstations with additional employees to maintain production, but new tasks were constantly being added and we were simply behind with the work. The two robots that we installed relieved us of a considerable amount of workload. We programmed them to weld bucket teeth and moved employees to other tasks such as welding corners. As a result, both processes became much faster. So not only did we avoid lay-offs, but instead our workers benefited overall on the implementation of the robots. Please note that the robotisation of tooth manufacturing increased the general level of safety in our department. Currently our workstations are equipped in extraction hoods which extract welding fumes. With manual welding stations the removal of these fumes was much more difficult. Now operators of robotised workstations are not exposed to ultraviolet or infrared radiation. The robots allowed us to shift workers not only from arduous and difficult processes, but also from workplaces very harmful to their health. Obviously, there are benefits for the management, too. If our robots are fully operational, we can rest assured that they will perform the programmed tasks. If, as is the case in our mine, the maintenance department requires 200 bucket teeth to be supplied on the next day, we have almost 100% certainty that it will get them. An industrial robot will not fall ill and is present on-site all the time. Does the current experience with robots encourage you to further invest in such equipment? We plan to purchase two additional industrial robots. At least two, because we don’t know how long the older robots from the 1990s will work. If they have to be replaced, we will certainly buy several more. Also, I’d like to make it clear that we don’t have any fear of further robotisation and we are happy to have decided to pursue it. 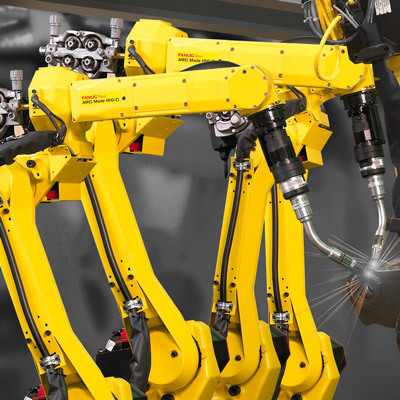 FANUC robots have performed reliably since 2009, they are fully functional and failure-free. Besides, we have considerable experience with robot implementation and operation. But probably the most important thing is that investment in robotised welding stations in case of lot production and high demand for workpieces is very quickly returned. We achieved a return on our investment within a year.